Here are some links to YouTube and other video sources of HamiltonJet powered vessels in action. 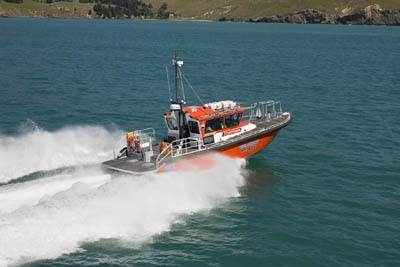 The new rescue boat in Sumner, Christchurch, New Zealand sets a benchmark for S&R vessels in New Zealand and around the world. Here's an application review and video of a helicopter lifting exercise conducted recently. More video to come. SeaCor Couger is the second of SeaCor's catamaran crewboats. Here are two videos of her. The Miami Dade Fire Department has a number of Metalcraft Marine-built fireboats utilising twin HJ322 and HJ364 waterjets. In the video below you can see the manoeuvring advantages of waterjets - particularly low or zero speed control. As the fireboats approach the burning vessel you see the jet wash advance forward of the transom as the reverse deflectors are lowered into the jet stream creating reverse thrust to equal forward thrust (thus zero speed is achieved). The deflectors also produce sideways thrust which is controlled using the helm so that full steering is available at all times when the pump is working. Because the vessel's throttles are still set to a high level there is a lot of water pumping through the jets and consequently a lot of thrust available to the skipper to use when manoeuvring. Without changing the throttle position he can raise or lower the reverse deflectors to creep ahead or astern, and at the same time he can turn the helm to change the vessel's heading. And with the high thrust from the jetstream these manoeuvres happen very quickly. With twin waterjets a skilled pilot can manoeuvre a vessel directly sideways - a feature which is now available to all if using HamiltonJet's blue ARROW electronic controls. The Magnum 750 utilises a single HamiltonJet HJ241 waterjet unit while the Magnum 850 is propelled by twin HJ241 jets. HamiltonJet waterjets are used on a large number of pilot vessels around the world. This video shows a vessel built by Kvichak in Seattle USA for the Dutch Pilots Association. Kaikoura Whale Watch have a fleet of five foil assisted catamarans using HamiltonJet HJ403 waterjets. Whirlpool Jet operate a fleet of vessels at Niagara Falls. These boats have triple HamiltonJet HJ362s or HJ364s. Shotover Jet in Queenstown, New Zealand, operate one of the world's best known thrillseeker adventure jetboat tours. Their latest boats use twin HamiltonJet HJ212 waterjets.